What's the Facebook Average Cost Per Click & How Do You Lower It? What’s the Facebook Average Cost Per Click & How Do You Lower It? With all of the controversy that has happened over the last year with Facebook, Mark Zuckerberg and Facebook advertising, you may be wondering if Facebook & its advertising platform have started to tank- but in reality it’s quite the opposite! As of Q2 in 2018 there were over 2.23 billion monthly active Facebook users worldwide, and that number is only increasing every day. As of Q1 in 2018, six million active advertisers were using Facebook to promote their products and services. The Facebook average cost per click & the average cost of Facebook ads is still a lot lower than other marketing vehicles and is still providing notable ROI for businesses. Sure, it’s true that Facebook is changing a lot of its policies & advertising features as a result of recent events. But these changes are meant to make the platform more user-friendly and people-focused. Facebook has not seen any substantial drop in users as a result, and therefore Facebook’s advertising platform is continuing to thrive. Some of these changes we’re talking about include changes to the advertising platform itself; the types of behaviors or interests that advertisers can target on Facebook are changing so as to promote privacy for regular users and a sense of transparency between business and customer. Some advertisers may look at these changes negatively. But in actuality, it’s better for business in the long run if your customer base can trust your brand and avoid feeling aggravated by your ads. Users will be more likely to click on and engage with your ads if they’re not feeling so bombarded with ads in general. And when conducted correctly, your Facebook ads will help build trust between your brand and that buyer. So, what’s the average cost of Facebook ads now that the platform is becoming more user-based than advertiser-based? We’re going to break down everything that dictates the average cost of Facebook ads and the Facebook average cost per click with tips along the way of how to lower them. The very first thing you have to do when you start running Facebook ads is decide what you want your end goal to be from the ads. Obviously, the end result most businesses are shooting for is sales, but what strategy are you following to achieve sales? Long-term, brand awareness, word of mouth, building loyal customers? Or short-term, less brand awareness and more immediate web traffic? Facebook has several different campaign objectives to choose from when you launch a Facebook ad, and the campaign type you choose needs to directly align with the end goal you are trying to achieve. For instance, let’s say you’re just trying to grow awareness and page likes (followers) on your Facebook page. Running a website traffic campaign that sends traffic to your site is not the best way to achieve this goal. Instead, you’d want to run a page like ad campaign (under the Engagement umbrella) to drive page likes for your Facebook page! Each Facebook campaign optimizes for what its goal is. This means that if you run a page like ad campaign, Facebook is going to show the ad to people within the target audience you select who are likely to like your page. Because of this, choosing the wrong campaign based on your goals will not only hinder the speed of your results but also significantly increase the cost. For instance, let’s look at the inverse of the previous example. Let’s say you were running a page like ad campaign (which optimizes for Facebook page likes), but you were measuring results in terms of website traffic to your site. The Facebook average cost per click to your site is going to be a lot higher in a page like ad campaign than a website traffic campaign. Choosing a Facebook ad campaign that directly mirrors the goals you are trying to achieve for your business will help lower the average costs of Facebook ads for your company. After you’ve decided which campaign you want to run, the next step is to decide who you’re going to target! Determining your target audience is a crucial part in running successful ads and in lowering your cost per click. For example, you don’t want to run ads that are geared towards parents and just target general adults between a certain age range; you’d want to be sure you’re actually targeting parents! Running ads to the wrong group of people will result in fewer results and therefore a higher cost per result. A lot of times when we analyze clients’ ad accounts that have been used prior to coming onboard with LYFE, we see a lot of wasted ad dollars or missed opportunities within the ad set level (the ad set level is the portion where you set the target audience). For example, we’ve seen companies that sell pet products target people “interested” in cats as opposed to people who actually own cats. It’s sometimes small but major changes like this that can be made to the target audience to better the results and lower the cost per result. You’ll want to be sure the target audience isn’t too large but also isn’t too small. Targeting too small of an audience will often exhaust the audience quickly (meaning they’ll start seeing the same ads from you multiple times and get tired of it), and targeting too large of an audience can cause a slow speed of results because it isn’t narrowed down enough. Hitting the sweet spot in terms of narrowing down your audience size without constricting it will help to lower the average cost of Facebook ads for your business. You may be looking at this header and be thinking, “…we’re placing them on Facebook..?” which is true, but there are several ad placements within Facebook where you can show your ad! In addition to being able to advertise on Instagram from your Facebook ad account, check out all of the other options within Facebook you can show your ad as well (pictured above). Some of these options are great, and some are not; it all just depends on what works for your business and target audience! In general, we at LYFE tend to stay away from using Facebook’s right column placement because you usually see a higher cost per result (and therefore fore higher Facebook average cost per click) with that placement. It’s important to pay attention to which placements are giving you the most results at the lowest cost so that you can focus on the top-performing placements and avoid wasting ad dollars on placements that aren’t producing any ROI! The ad creative is the third and final part of launching an ad campaign, and it’s equal parts important as the first two! There are several different “ad types” you can include in your Facebook ad campaign including a static image, a video, carousel ads, collection ads, slideshow ads and canvas ads (see below for an example of carousel ads). Videos tend to perform the best on social media as opposed to static images, but again, it really all depends on what is going to work best for you and your business. For instance, carousel ads and dynamic carousel ads really work well for ecommerce! A/B split testing ads really allows you to see which ad type is giving the best results at the lowest cost, which allows you to overall lower the Facebook average cost per click of your ads. One major thing to keep in mind no matter which type of ad you run is that Facebook only allows 20% text or less on the image or video thumbnail of an ad. This means that if your ad has more than 20% text on it, Facebook could choose to “disapprove” the ad and keep it from running! Even if it has anywhere between 1% and 20% text, Facebook will still more than likely lower the reach on the ad (meaning you could spend the same amount on ad with no text on the image and reach more people!). An easy way to check an ad’s acceptability to run or not is to use Facebook’s text overlay tool (see below). But the bulletproof way is to use images or video thumbnails that have zero text on them. When Facebook is looking at all of the ads submitted to run, it reviews them and decides which to show over others that are trying to target the same audience. We’re going to dive more into this in just a second, but how much text is on your ad creative plays a part in that decision. The more your ad creative complies with Facebook’s rules, the more likely Facebook is to serve that ad, and therefore, the lower the average cost of Facebook ads will be for your business. Let’s talk more about Facebook’s ad review process because it certainly plays a part in how much your ad results cost on Facebook! As we mentioned at the beginning of this blog, Facebook is becoming more and more focused on the average user. This means they are trying to filter out spammy, unnecessary ads from users’ feeds. Facebook gives each ad what’s called a Relevance Score to help determine how helpful or “relevant” an ad is to the audience it’s targeting. The Relevance Score ranks from 1-10, and the higher the score, the better. The lower the score, the more Facebook is going to show a competitor’s ads over yours. So, what determines your Relevance Score? Well, let’s take a look. People have the option to hide or block your ad as they see it, or they have the option to like it, comment on it, click on it etc. The way people respond to your ad dictates the Relevance Score that Facebook gives your ad. The higher your ad’s Relevance Score, the more it will be served over competitors’ ads who are targeting the same audience, and therefore the lower the cost per click is likely to be. This review process not only keeps users from being overwhelmed with spammy ads, but it also prevents Facebook’s ad platform from being monopolized by the big users! Companies can’t just pay more to beat out the competition; their ads have to be meaningful, have substance and score a higher Relevance Score in order to beat out the competitions’ ads. If you’re having to pay more than a competitor to reach the same audience, your cost per result is almost immediately going to be higher than theirs, so it’s important to pay attention to how well your ads are performing! So far, we’ve talked about all of the things that you can do to lower the Facebook average cost per click, but now let’s start discussing real numbers. In a study that Wordstream conducted, the Facebook average cost per click across multiple industries was $1.72. 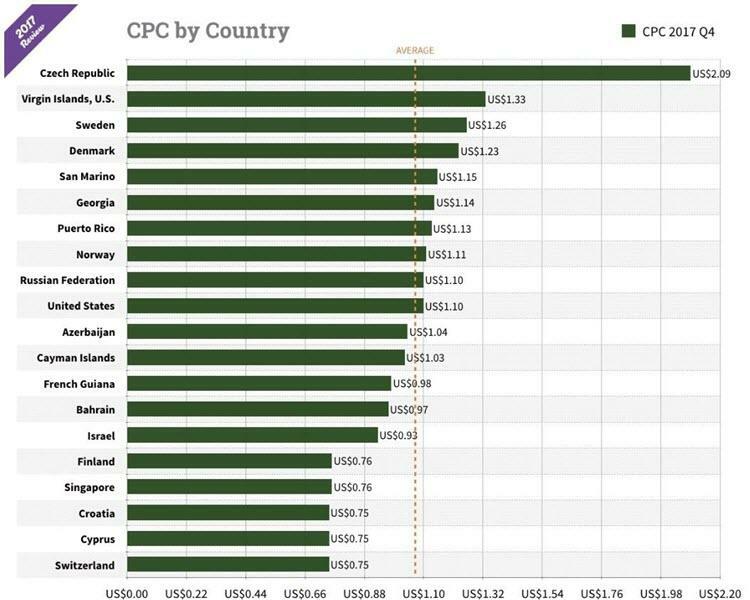 Additionally, AdEspresso performed a study in 2017 that showed the Facebook average cost per click based on which country you’re targeting (see below). Obviously, the results of any Facebook ad campaign are going to vary and be different depending on the industry, the business, the target audience, the ad budget, and the ad creatives. However, following all of the tips listed in this article can help your company fall below average in cost when it comes to the Facebook average cost per click! Helping lower the average cost of Facebook ads for your business will help you see more results from each dollar you spent and ultimately see ROI for your company! Thinking of running Facebook ads for your business but don’t know where to start? Contact us to learn more about the average cost of Facebook ads and how they could work for your business! Whether you’re brand new to Facebook ads or have ran them for a while with no success, we’ll be more than happy to answer any questions you have.